Let the Full/Full Bunk Bed withstand all of the adventures and excitement of a youth bedroom environment! Whether your child is sleeping, roughhousing, or studying, this bunk bed offers the perfect escape. Crafted of metal, this piece easily complements the ever changing décor of a child's room, as it is available in a neutral black or pewter finish. This full-over-full bunk bed offers double the sleeping space without sacrificing the entire bedroom. A sturdy step ladder provides easy up and down access to the top bunk, while safety guard rails on the top bunk ensure safety. Configurable as two full beds. Some assembly required. The Youth Beds and Bunks Full/Full Bunk Bed by Powell at HomeWorld Furniture in the Hawaii, Oahu, Hilo, Kona, Maui area. Product availability may vary. Contact us for the most current availability on this product. 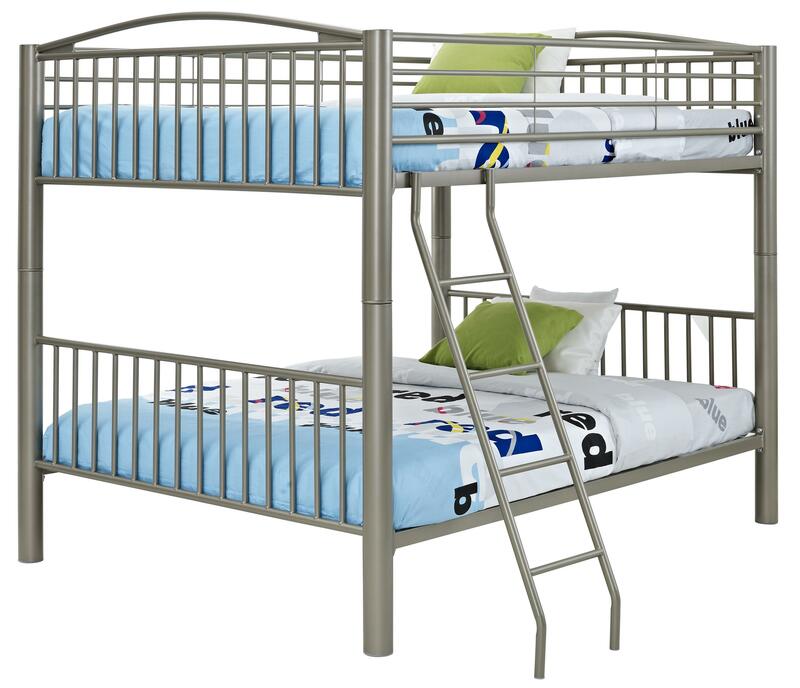 Bunk Bed Construction Bunk beds feature heavy gauge metal tubing, full-length guardrails, and sturdy welded metal slat system for mattress support. Case Construction Some pieces feature frames constructed with heavy gauge metal tubing or wrought iron and casting elements. Other are constructed on solids woods such as pine. Warranty This product is covered under a limited 1-year manufacturer's warranty. Additional warranty information included in packaging. Whether shopping for your little princess or finding that perfect space saving bunk for your child's room, the multiple design styles, features and functionality of these bunks and beds are sure to fit your needs. Traditional or contemporary, pieces of this collection will add style to any bedroom décor without sacrificing sturdy construction and safety. All bunk beds are tested and certified by an independent testing laboratory and are designed and engineered with security in mind. Choose the right piece for your child today. The Youth Beds and Bunks collection is a great option if you are looking for Contemporary furniture in the Hawaii, Oahu, Hilo, Kona, Maui area. Browse other items in the Youth Beds and Bunks collection from HomeWorld Furniture in the Hawaii, Oahu, Hilo, Kona, Maui area.